Poststructuralist theory has been broadly influential throughout the humanities and social sciences for two decades, yet sociolinguistic engagement with poststructuralism has been limited to select subfields. In this paper, I consider the possibilities for richer cross-disciplinary work involving sociolinguistics and poststructuralist social theory. I begin by describing the place of social theory within sociolinguistics, paying attention both to the possibilities of interdisciplinarity and the resistance to it. I then introduce the basic tenets of poststructuralism, focusing primarily on its two main constructs, ‘performativity’ and ‘discourse,’ and briefly discuss the discontentment with structuralism that resulted in ‘the linguistic turn’. 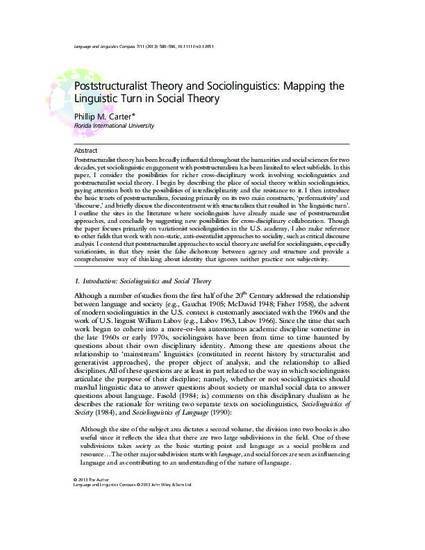 I outline the sites in the literature where sociolinguists have already made use of poststructuralist approaches, and conclude by suggesting new possibilities for cross-disciplinary collaboration. Though the paper focuses primarily on variationist sociolinguistics in the U.S. academy, I also make reference to other fields that work with non-static, anti-essentialist approaches to sociality, such as critical discourse analysis. I contend that poststructuralist approaches to social theory are useful for sociolinguists, especially variationists, in that they resist the false dichotomy between agency and structure and provide a comprehensive way of thinking about identity that ignores neither practice nor subjectivity.